The business community commended the commissioning of the Southern Expressway hailing it as a move that will boost regional economic growth with an efficient transportation system that is vital to develop businesses and attract investments. Ceylon Motor Traders Association Chairman Tilak Gunatilleke said that the construction of a highway that would connect major commercial cities and enhance regional development was a long felt need. The highway will help bridge the rural-city gap and boost industrial growth. He said that there should be more highways of this type which will link cities. 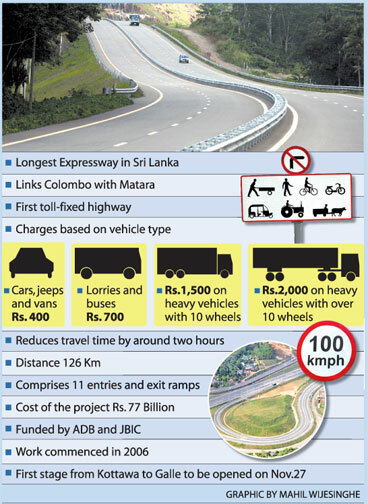 The Southern Expressway is the first and the longest expressway which links Colombo with Matara. The first segment of the 126 Km highway is scheduled to be opened by President Mahinda Rajapaksa on November 27. The Chambers said that the standard of the highway should be maintained and road rules should be strictly adhered to ensure safety of motorists. Director Traffic SSP, K. Arasaratnam said that a special police squad will be deployed to ensure observance of road rules. The National Chamber of Commerce President Asoka Hettigoda said that the Highway will be a major impetus for rural economic growth and added that a sound transportation network is essential to expedite growth of regional industries. The American Chamber of Commerce President Vijaya Ratnayake said the construction of the Southern Expressway is a positive move that will enhance trade and commerce in the country and attract foreign investors. ‘The country needs such highways to entice visitors to the country and thereby boost tourism”, he said. Agriculture sector experts said that the transportation of goods will be quicker and post harvest loss could be further reduced. CIC Agribusinesses Managing Director Kirthi B. Kotagama said that the transportation cost and travel time will be cut-by around 60 percent and the quality of products could be maintained. Post harvest loss has been high due to poor road infrastructure. Currently the post harvest waste is around 40 percent. Chevron Lubricants Lanka PLC Managing Director Kishu Gomes said that an efficient transportation sector is essental to woo investors and to develop industries. A sound transportation network will help minimise transportation costs and enhance competitive advantage. Road Development Authority sources said that the strectch from Kottawa to Galle has been tested and added that it is ready for use. The work on the Rs. 77 billion project commenced in 2006. The Asian Development Bank and Japan Bank of International Corporation are the main funding agencies of the project. The 65 -Km stretch from Kottawa to Kurundugahahetekma was undertaken by JBIC and the leg from Kurundugahahetekma to Godagama, Matara, distance of 64.8 km was undertaken by ADB. Transportation experts said when completed the travel time from Colombo to Matara will be reduced by more than two hours. The Southern Expressway is the first toll charging road way in Sri Lanka. Tolls would be charged based on the type of vehicles. Cars, jeeps and vans that come under the first category would be charged Rs. 400 while lorries and buses under the second category Rs. 700, heavy vehicles, the third with 10 wheels Rs. 1,500 and heavy vehicles with over 10 wheels Rs. 2,000. All toll counters would be handled by the RDA.